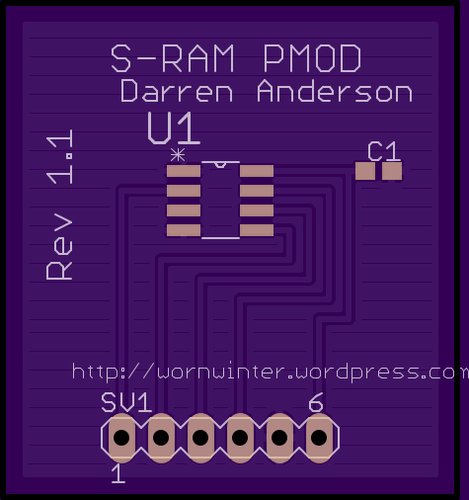 In this series, I’ll be covering the design and building of an SPI SRAM PMOD for the Digilent Basys2 FPGA Board. This project came about more out of necessity than anything else. I want to design an 8-bit CPU on my FPGA board, but it has no RAM (other than the block ram in the FPGA, but it is very limited). Having searched and searched, I was unable to find a premade PMOD (the name that Digilent gives to expansion boards) that contained RAM, so I thought, “Hey! Why not make my own?”. Microchip 23LC1024 – SPI SRAM. AVX ceramic capacitor. (6.3V 100nF). As you can see, this isn’t exactly a very big project, which is good, because it accomplishes the task at hand without costing a fortune. The bill of materials cost is extremely low, working out at roughly £12.26, which already includes the cost of the PCB. I’ve found an excellent PCB fabricator at OSH Park. They do large runs with multiple boards in order to keep costs down and end up costing far less than most other fabricators. 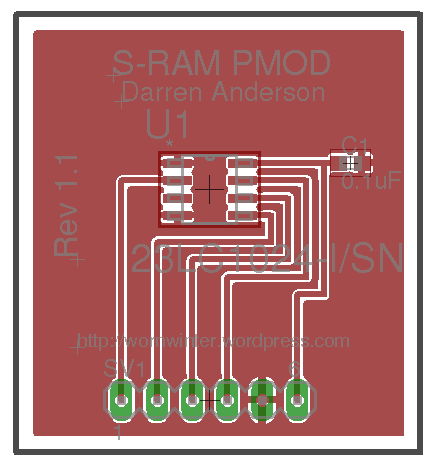 My SRAM PMOD design in eagle. My SRAM PMOD design rendered by OSH Park. You might notice in my designe that the “Chip Select” pin (pin 1) is tied low at all times. This is because I don’t plan on disabling the chip at any time, and also because my Basys2 PMOD header doesn’t have enough I/O space to connect it anywhere else. This is as far as I am currently. After I receive my boards and components I’ll write another article showing it being assembled and tested. I’ll also include the eagle schematic and board files for download so you can build one yourself! I'm a bit of a nerd. Love anything to do with computers or coding. Frequently found tinkering with electronics. Usually not breaking them. I have been known to.